Ejen Chuang spent three years photographing people constructing costumes and gathering at events to model their efforts for Cosplay in America V2. This lush combination of portraiture and documentary photography book takes us on a tour of fan conventions across the nation from Comic-Con International in San Diego and Los Angeles's Anime Expo to DragonCon in Atlanta and New York Comic Con in celebration of the pastime of cosplay. The act of dressing up as characters from manga, video games, and anime can require hundreds of hours of build time and painstaking attention to detail; and with five hundred cons per year in the United States and a dedicated community, the line between hobby and lifestyle blurs. 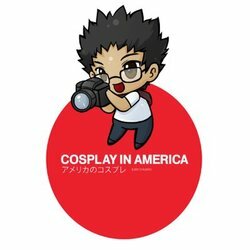 Ejen Chuang released his first book in 2010, volume 2 in 2015 and will be returning to cosplayers in his first book for Cosplay in America : 10th Anniversary in 2020.